"Eco-Friendly Solutions for a Cleaner World"
California Escalator Cleaning, a division of National Escalator Cleaning has been providing Eco-Friendly and environmentally safe alternatives utilizing high technology and state of the art equipment and cleaning agents available. Our escalator cleaning process cannot be compared to any other. We exclusively use the Rotomac 330, Rotomac 340, Rotofast 500 and Rotofast 540 on every cleaning assignment. The Rotomac 330, Rotomac 340, Rotofast 500 and Rotofast 540 are all manufactured in Germany to safely and quickly clean your escalator or travelator. The problem, oil, grease, dirt and liquid collect on the steps and risers with everyday use. Without proper cleaning and removal, these items pose a safety hazard! Our escalator cleaning service utilizes a unique vacuum recovery system tank that captures our biodegradable cleaning solution, as well as the grease,oil and dirt that is released from the steps and risers. The vacuum recovery system also allows us to dispose of the hazardous waste properly, in adherence to EPA guidelines. Our expert technicians provide our professional and competitive Escalator Cleaning Services nationwide. 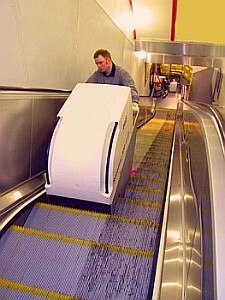 Just give us a call today, and have a cleaner escalator for all to enjoy! Average lead time with a signed purchase order is 3 weeks or sooner. "Our Quality Work Today, is our Reputation Tomorrow!" "A Woman and Minority Owned Business"
Proudly Serving All California and Beyond!